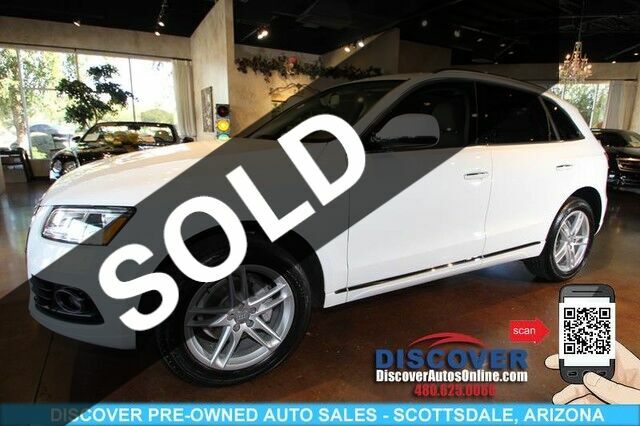 Discover Pre-Owned Auto Sales of Scottsdale Arizona is pleased to offer this beautiful 2015 Audi Q5 quattro 2.0T Premium Plus Sport Utility AWD with only 44,143 miles. Drive home in your new pre-owned vehicle with the knowledge you're fully backed by the CARFAX Buyback Guarantee. Perfect for the on-the-go family, this Audi Q5 Premium Plus is an SUV everyone will love. With exceptional mileage, options and power, you'll insist on driving it on all your outings. You'll love the feel of AWD in this 2015 Audi Q5. It provides a perfect balance of handling power and control in virtually every driving condition. The Audi Q5 Premium Plus is exactly what you would expect out of a Audi. It's decadently opulent, meticulously engineered and unapologetically grandiose. This vehicle has been well-cared for inside and out. The paint is flawless with no damage or obvious signs of wear. Added comfort with contemporary style is the leather interior to heighten the quality and craftsmanship for the Audi Q5 This Audi includes: WHEELS: 8.0J Tires - Front Performance Aluminum Wheels Tires - Rear Performance BANG & OLUFSEN SOUND SYSTEM Premium Sound System PREMIUM PLUS PACKAGE Mirror Memory Seat Memory Auto-Dimming Rearview Mirror Power Door Locks Keyless Entry Power Folding Mirrors PISTACHIO BEIGE, LEATHER SEATING SURFACES Leather Seats IBIS WHITE CARGO NET (PIO) AUDI GUARD WHEEL LOCK KIT (PIO) Wheel Locks *Note - For third party subscriptions or services, please contact the dealer for more information. * At DiscoverAutosOnline.com , we strive to provide you with the best quality vehicles for the lowest possible price, and this Audi Q5 quattro is no exception.